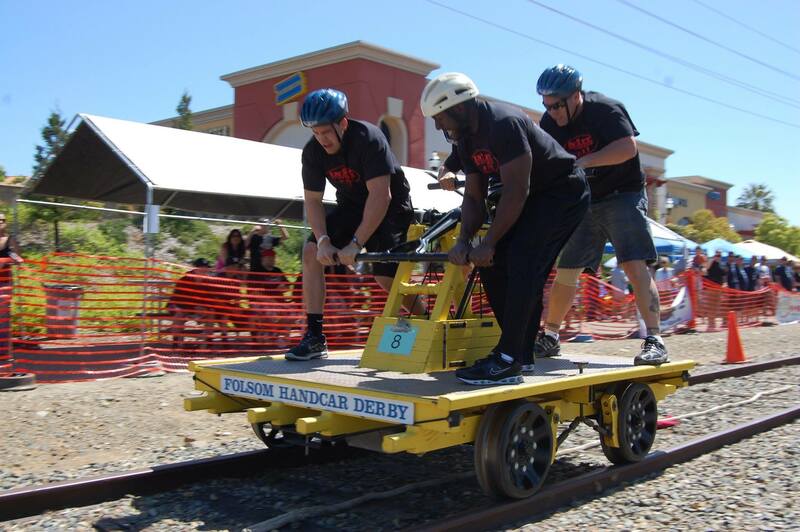 Since 1991, Folsom, El Dorado, and Sacramento Historical Railroad Association has hosted the annual Folsom Handcar Derby on the former Southern Pacific Placerville Branch, where local businesses, groups, and charities compete to get their handcar across the finish line in the fastest time. The event also features competitions for individual strength and endurance, and it’s the only known event in the world to feature quadripede racing! Our official racing handcars are provided for time trials & racing. All proceeds benefit Folsom, El Dorado, and Sacramento Historical Railroad Association, a non-profit 501(c)(3) organization. Each team is comprised of 5 members: 4 pumpers and 1 pusher. The pusher pushes the handcar into motion at the beginning of the track, and then the pumpers take over and pump the handcar to the end of the track. Each team’s pusher will automatically be entered in the pushers contest on Sunday. Pushers are placed in weight divisions and compete on how far they can push an empty handcar down the track with a single push. All must be past first place medal winners from the Folsom Handcar Derby and other handcar races. The race takes place along East Bidwell Street at Broadstone Parkway in front of Broadstone Marketplace. 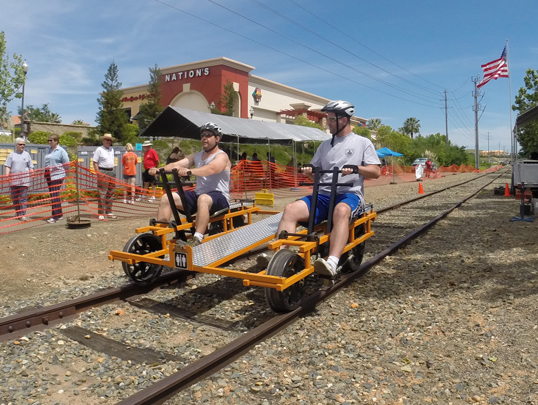 Teams get practice, trial time run, and safety training on handcar. All teams from each division running trial runs will advance to the finals. Awards will be presented to the first and second place teams of each of the nine divisions when at least 4 teams are entered in that division. Pusher Contest awards will be given to the top three distances in all divisions. All teams are included. It’s an event tradition! Entry fee is $25.00 per person for the 5 member team (total $125.00). 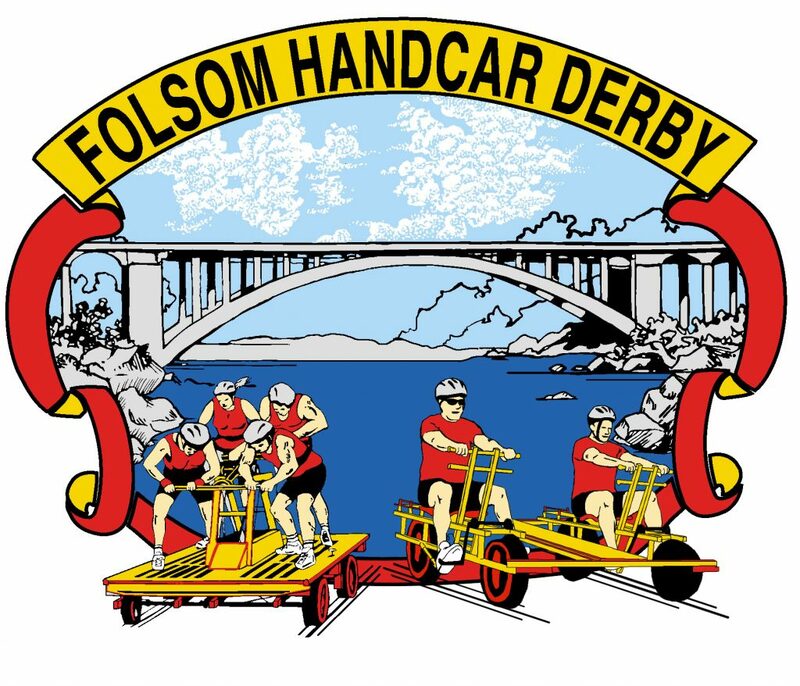 The first 20 teams entered will receive a short-sleeve Folsom Handcar Derby t-shirt (5 shirts per team, $3.00 extra for each XXL shirt). Quadripede racing is $10.00 per person per race. Two people are required to race.